Little Common Football Club is poised to play its first ever FA Cup match - at home to its new landlords. The Commoners will host Eastbourne United AFC - the team with whom Common are groundsharing this season - in the extra preliminary round today (Saturday). Kick-off at The Oval is 3pm and the winners will be away to Littlehampton Town or Chatham Town in the preliminary round on August 19. 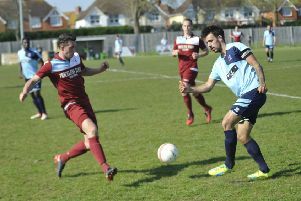 Eldridge’s side, which finished runners-up in Macron Store Southern Combination Football League Division One last season, will be aiming to spring a surprise against an Eastbourne team which came seventh in the Premier Division. “I think it’s probably destiny we would be playing Eastbourne United,” Eldridge continued. “We would’ve probably preferred to play a team we didn’t know, from a different league possibly, but it’s a good game for us. They’re going to be fearing us as much as we fear them. Common have played three higher level and three lower level opponents in their pre-season friendlies over the past few weeks. Their final warm-up match ended in an 8-2 victory against Hildenborough at Mascalls Academy in Paddock Wood on Saturday. Eldridge scored two of the goals, one of which was a penalty, and there was one apiece for Rosh Wells, Nick Richardson, Zack McEniry, Jared Lusted, Sam Ellis and Tate. Tate, who is now doubling up as assistant manager, was playing his first 45 minutes after suffering an ankle ligament injury during the summer. “Friendlies are what they are; you have to put a bit of perspective into them,” Eldridge went on. “Some people will be hellbent on results, some people will use them for different things. “It’s about giving everyone game time, maybe looking at different people and building up your fitness. With the good range of friendlies we’ve had, we’ve done that. From last season’s squad, Common have lost influential defender Dan Cruikshank, who isn’t playing football at the moment. But they’ve brought in another centre-half, Lewis Parsons, from Hailsham Town, plus midfielder Liam Ward and attacking player Ellis, both from Westfield. Ward, incidentally, is the son of Dave Ward, who many will remember as a fine midfielder for Sidley United from the not too distant past, and has impressed in the warm-up games. What’s more, Charlie Bachellier is back from university and Jerome Smith is expected to feature before going travelling at the end of August. Accomplished defender Smith was a regular fixture in the Common back line before having spells in the Ryman League with Hastings United and East Grinstead Town over the last two seasons.